We simply cannot say enough good things about this tutorial - it continues to set the standard for learning to play tinwhistle. L.E. 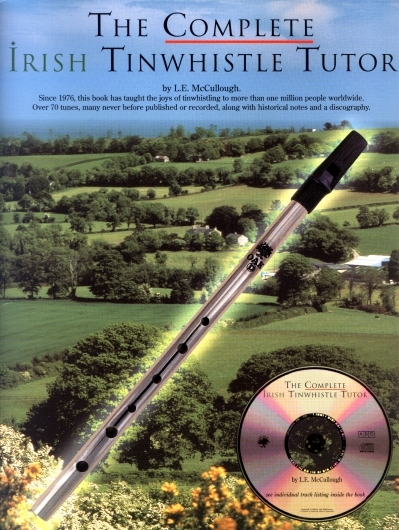 McCullough has been teaching traditional Irish Music on tinwhistle and flute since 1972 - the amount of information that this book covers is amazing. The one thing that it doesn't cover in detail is how to read sheet music. If you're new to reading sheet music, it is recommended that you pick up a tutorial that explains the basics in more detail also ("Fun With the Tinwhistle" or "You Can Teach Yourself Tinwhistle" would be excellent choices). Even experienced players will gain much from this book/CD set. The CD has 91 tracks, and includes instruction and playing examples by L.E. McCullough. It also includes all the tunes from the book. You will need to have a Whistle in the key of D to make proper use of this book. All the tunes are written in keys that are meant to be played on a D whistle. Take a look at the Whistle Section of our online catalog if you need a D Whistle.